This software-based room correction system can provide you with a better mixing environment. It might seem like some kind of voodoo, but the ARC System works brilliantly and should be of particular interest to project studio owners. Improves nearly any setup. Does more than a conventional EQ. You get a 'free' condenser mic! Portable. Setup is straightforward. Only four target EQ curves. Plug-in format reduces versatility. The ARC plug-in sits on the master bus of your DAW. You must use the microphone that comes in the box to take your measurements. Taking measurements is a five-step process. Acoustics and room response are frequently overlooked during the mixing process. You may be familiar with the likes of bass traps, foam shapes and high-end products like diffusers, but there are downsides to traditional acoustic treatment methods such as these. If you don´t know what you´re doing, it´s not easy to use them effectively, and they aren't always suitable for people using rented space, those who mix in many different environments (such as laptop musicians or roving engineers), or, indeed, musicians whose studio overlaps with their living space. A room's 'response' refers to how the acoustics and the speakers interact with each other. Obviously, as flat a response from the room as possible is ideal, so that you don't overcompensate in your mix for any frequencies that the room absorbs, or cut any that it enhances, thus creating something that's unbalanced on other systems. 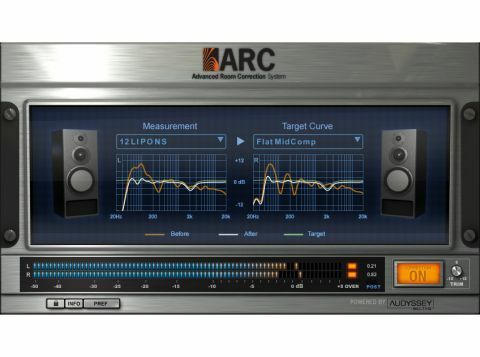 Seemingly spotting a gap in the market, IK Multimedia has teamed up with Audyssey Laboratories to produce the ARC System (ARC stands for Advanced Room Correction), which is aimed squarely at improving the sound of your mixing environment, whether you already have acoustic treatment in place or not. The package consists of a plug-in to run inside your DAW (which always needs to be inserted last in the chain on the master bus), a separate measurement program and a reference microphone (which also doubles as a decent recording mic) in a carry case. Powered by Audyssey's existing MultEQ technology, ARC is designed to provide a wider 'sweet spot' and to correct multiple listening positions rather than improving just one while compromising others, as is often the case with conventional EQ. IK boasts that, unlike other systems, it corrects frequency and time domain issues (such as phasing), while keeping within the inherent frequency limits of your speakers. The measurement software is a standalone application and is extremely easy to operate, with on-screen instructions. At step three, you set the required volume for the test signals that the software pumps out to analyse your setup, before step four, where measurement proper begins. It´s essential to take the initial measurement from the centre of your listening position and then in an alternating left/ right symmetrical pattern, which is actually easier than it sounds. You need at least 12 measurements to proceed to the last stage, where the compensatory EQ curves are generated and stored for use, but you can take up to 32 for more precise results. Each curve can be given a name and a picture of some speakers assigned to it - handy when using multiple monitoring setups. To evaluate ARC, we started in 'studio one' - a small room, about 11x10' with a low 7' ceiling, carpet and some acoustic treatment (diffusers and two bass traps). Monitoring comprised a pair of Alesis Monitor One MK2s with a Genelec powered sub (ARC works fine with subs, by the way), which is a typical project studio setup with a balanced, neutral sound. We did three tests in studio one; the first with the minimum of 12 measurements in the listening position, and the second with the full 32. For the final test, we compensated for two positions, with 20 measurements at the listening spot and 12 further back in the room - similar to the 'client couch' position described in the ARC manual. We also put ARC through its paces in 'studio two' - a larger room at 20x16' with a high 11' ceiling. This room was bedecked with heavy drapes on the back and side walls, and the listening spot was quite close to the speakers, so room anomalies were less of a concern. The 'monitoring' in this instance, however, constituted a pair of trusty old Mission 701s, which, while great for pumping out tunes, aren't intended as studio monitors, and so provided a good test of whether ARC can work its corrective magic on the speakers themselves. In studio one, ARC really tightened up the response across the board and put paid to the low-end problems thrown up by the dimensions of the room. Although all three tests gave slightly different results, the frequency graphs showed a clear trend caused by the small room. Over in studio two, while ARC didn't transform the Missions into true reference monitors, it did flatten out their tone and tamed their slightly skewed lower-midrange, making them more suitable for musical work. In both environments, the sound became more consistent across the measured sweet spot, and when moving around the listening position, any annoying, 'swimmy' phasing was virtually eliminated. Transients became tighter, and the high-end snap of kick drums seemed to connect better with their low-end 'oomph'. ARC offers four different target EQ curves to tailor the sound, and we found that the Mid Comp option (with a dip at 2kHz) worked best in both situations. Overall, the ARC System offered real sonic improvements and gave us greater confidence in mixing. The final acid test came when we compared the adjusted monitor sound to the legendary AKG K240DF studio reference headphones, which boast an extremely flat response. It was apparent that ARC had indeed coaxed a similarly neutral tone from the Alesis monitors. Disadvantages of the ARC System are that you can only enjoy its benefits when the plug-in is active, and so not when using, say, a regular media player application. Some might feel that it's a little expensive, too, especially when they consider that KRK's forthcoming ERGO system costs not much more and is an 'always on' hardware solution, audio interface and monitor switcher to boot (although, of course, we can't yet vouch for the quality of its room correction). Then again, you can easily spend far more on conventional acoustic treatment products. If you´re serious about getting as accurate a sound as possible from your mixing environment, you won't go far wrong with the ARC System. It will be especially valuable if you can't acoustically treat your room to a sufficient degree in the conventional manner, or if you need portability.